In order for any athlete to be at his or her very best, injury prevention and physical activity must go hand in hand. Athletic trainers play a critical role in preventing, identifying and treating injuries. U.S. Soccer’s Recognize to Recover program highlights these health care professionals and how they help protect player health and safety. Athletic trainers play an important role on your team. They help to protect your athletes from many sports-related injuries. They provide medical care and supervision during games and practices; rehabilitative services should an injury occur; and develop injury prevention programs to keep athletes healthy and on the field. They also provide injury prevention education during practice, one-on-one time with athletes and through regular communication with parents. Having an athletic trainer on your team also helps support the decision of whether or not to put an athlete back into a game following injury. Based on his or her medical training, the athletic trainer can make this decision – allowing coaches to focus on coaching, the parents to focus on cheering and the athletes to focus on playing. U.S. Soccer requires an athletic trainer present at all U.S. Soccer Development Academy home games. A study from the American Academy of Pediatrics showed that the presence of athletic trainers can have a significant positive impact on student athlete health, resulting in lower injury rates, improved diagnosis and return-to-play decisions for concussion and other injuries. 62 percent of all organized sports injuries occur during practice. Athletic trainers are health care professionals who collaborate with physicians to provide preventive services, emergency care, clinical diagnosis, therapeutic intervention and rehabilitation of injuries and medical conditions. They work in a variety of settings including educational institutions, professional and amateur sports organizations, hospitals, clinics, corporate workplaces, public safety services, the military and performing arts. Athletic trainers must always work under the direction of a physician. Athletic trainers must graduate from an accredited baccalaureate program and more than 70 percent have a master’s degree or higher. Upon completion of an accredited athletic training education program, students become eligible for national certification by successfully completing the Board of Certification (BOC) examination. Athletic trainers are licensed or regulated in 49 states and the District of Columbia. This article is directed towards coaches and technical staff of grassroots level soccer to be able to gain an understanding of, and then implement basic monitoring practices in their own environment. Increasingly busy schedules mean high-intensity sessions are separated by little recovery. Absence of days for physical and psychological regeneration and the expectation of high work-rate from players can have negative consequences. Accumulation of fatigue over days and weeks might reduce ability to exercise and increase susceptibility to sickness and injury. The use of monitoring techniques can have several benefits in the soccer environment. 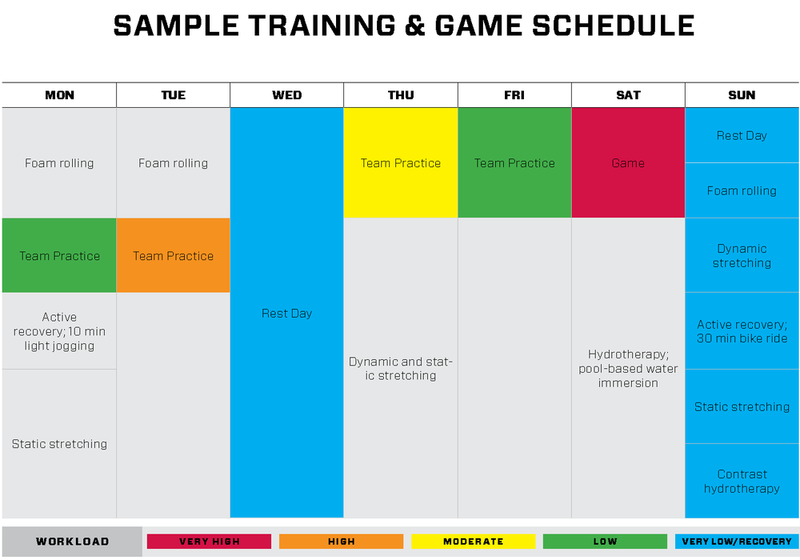 Consistent recording of the duration, content and intensity of training sessions and games can be carried out for both the team and individual players. Information collected can be used to ensure varied training prescription with high and low intensity days with periods for promoting fitness as well as recovery. As a result, the likelihood of overtraining and other negative consequences is reduced. RPE is popular for measuring training load - Seen as a global measure of exercise intensity. Can be used to measure load in any sport. Easy to use and requires no equipment or cost. Thirty minutes after a session, a player may be asked ‘How was your workout’? Players provide an RPE score of how hard the session was on the 0-10 scale (Figure 1). Session Training Load = RPE x Session Duration (minutes). Can change depending on aims and content of a session. Accounts for situational, physiological and psychological factors. Can help with varying ‘hard’ and ‘easy’ sessions to reduce monotony of training. Ensures variation in training load (such as in pre-season, and weekly cycle before a game). Can take into account weekly activities and sports undertaken other than soccer. Subjective reporting may vary with age and experience. More experience gives appreciation for range of intensities and what is ‘maximal’ effort. Rampinini, E., Impellizzeri, F.M., Castagna, C., Abt, G., Chamari, K., Sassi, A. and Marcora, S. (2007). Factors influencing physiological responses to small-sided soccer-games. Journal of Sports Sciences, 25, (6), 659-666. Halson, S.L. (2014). Monitoring training load to understand fatigue in athletes. Sports Medicine, 44, S139-147. Coutts, A.J. (2001). Monitoring training in team sports. Australia’s Coaching Magazine, 24, (3), 19-24. Eston, R. (2009). What do we really know about children’s ability to perceive exertion? Time to consider the bigger picture. Medicine and Science in Sports and Exercise, 21, 377-383. Dellal, A., Lago-Penas, C., Rey, E., Chamari, K. and Orhant, E. (2013). The effects of a congested fixture period on physical performance, technical activity and injury rate during matches in a professional soccer team. British Journal of Sports Medicine, 49, (6), 390-394. Shoes should fit properly and are laced tight each time. Appropriate shoes (and soles) should be worn for the field surface being played on. Shin guards should end just below the knee and fit snuggly around the ankle bone. Socks should completely cover the shin guards. Soccer balls should be properly inflated, water-resistant and the correct size for the age group. Goalkeepers should wear padded gloves with finger-protectors. Goalkeepers should wear long-sleeved shirts and long pants, possibly with elbow and knee padding. Mouth guard is an option to protect teeth, lips and tongue. Jewelry should not be worn – except for a medical alert bracelet. Ankle sprains are the most common soccer injury for players in high school and younger. Strengthening the ankle by using a balance board can help prevent ankle sprains. Learning proper technique when jumping and landing can prevent many non-contact injuries to knees and ankles. A 15-20 minute regeneration session after practice or a game speeds up the body’s recovery. Players should spend at least 20 minutes stretching and warming up at the beginning of practice or before a game. Guided warm-ups prepare the body for more strenuous activities and may include a variety of exercises meant to stimulate the body and simulate game-play skills. Training and strengthening will enhance the body’s natural protection systems, especially for ankles and knees. Muscles around the joints can be strengthened through consistent practice of specific training exercises, like walking lunges, single toe raises and single leg hops. The affected muscles stabilize the joint and reduce the risk of injury. The upper body can be strengthened to help protect players during challenges and shielding without sacrificing speed or agility. Injury treatment and recovery are important for returning players to the field safely and preventing future injuries. Reducing swelling and pain as quickly as possible after an injury allows for faster recovery and evaluation by a doctor. After an injury, the muscle or joint will not be as strong as before the injury. A player returning to play without allowing the injury to completely heal and recover strength is at risk for a repetitive injury which is often more serious. In our continued commitment to player health and safety the importance of recognizing safety standards in soccer goals and processes to ensure a safe environment for all players is paramount. Ensuring education and awareness with steps to maintain and secure goals to prevent injury is vital for all coaches and referees as we build a safety culture in our game. Click here for a safety booklet providing basic soccer goal safety information along with a soccer equipment safety checklist . A proper warmup is an important first step to preventing injury in soccer. U.S. Soccer’s Recognize to Recover program highlights the elements of an appropriate warmup to maximize the injury prevention benefits before any game or practice. A good warmup creates a foundation for good performance. In youth soccer, an appropriate warmup should last at least 20 minutes. Numerous studies show the dramatic effect a proper warmup has in reducing injuries on the field. During the warmup, players prepare mentally as well as physically. A good warmup helps players focus their attention on the game or practice that follows, increasing the level of performance. Warmup exercises typically concentrate on preparing the body for play. These physical activities target different muscles which are important for maximizing soccer performance. 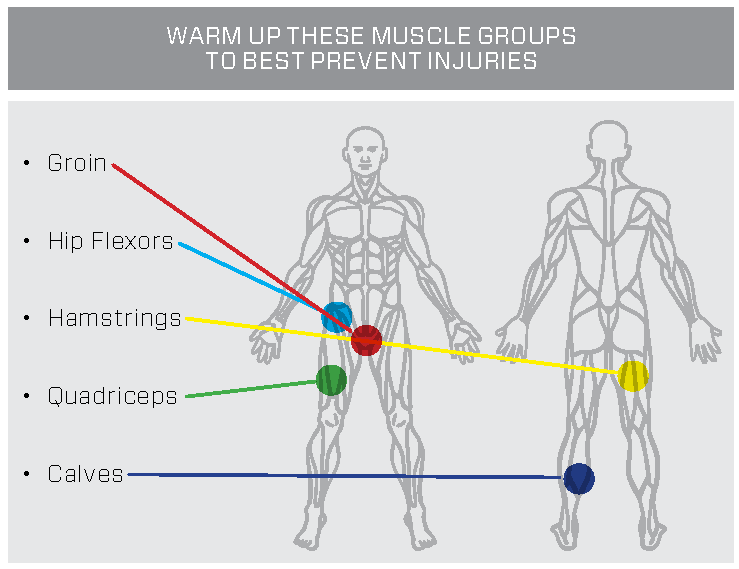 In doing so, the warmup also helps protect the player from injuring these different muscles. Warmup activities should build in intensity and lead into the activity which follows, whether a game or practice. Incorporating a variety of exercises into a warmup program may allow players and coaches to create a program tailored to their interests and needs. Some exercises or activities may not be appropriate for certain age groups or skill levels. One warm-up program that has shown to reduce injuries by as much as 50 percent is FIFA 11+. Find out more about the program on the FIFA website. Learn more about how to warm up, cool down and stay prepared between practices and matches with Healthy Essentials from Johnson & Johnson. Begin the warmup with low intensity movements like jogging, skipping and shuffling side-to-side. Increase the heart rate gradually to be ready for the practice or game to start. Stretching is extremely important. Stretching should be dynamic, not done standing still. Incorporate full range of motion stretches into low-intensity movements, like walking or jogging. Integrate ball skills into the warmup, such as dribbling at slower speeds. This is an opportunity to work on technical skills and become more acquainted with the ball. A typical warmup progresses from linear to multi-directional activities. Initial warmup exercises should have players moving along a straight line. Once muscles have begun to warm, exercises can incorporate changes of direction to increase the intensity and effectiveness of the warmup. The warmup should finish with accelerations, sprints or high- intensity changes of direction to simulate actual game-play situations to make sure the player is prepared for the game or practice session. Recovery is an important component to the design and application of periodization in soccer. An extensive schedule of practice and games, in addition to other stressors outside of the sport can compound the level of fatigue experienced by an athlete. U.S. Soccer’s Recognize to Recover initiative promotes achieving balance between training and competition with both recovery and rest to help ensure athletes are physically and mentally prepared to perform. Recovery is usually the period between the end of one practice and the start of the next. Sleep, nutrition, and hydration should make up the foundation of an athlete’s recovery to counteract fatigue, reduce the risk of injury, and help drive the body’s adaptive responses to exercise. There are a variety of recovery interventions available that can be utilized by an athlete to help boost their recovery process. An emerging recovery method with several proposed physiological effects, similar to those of massage, that may assist in recovery and reduce muscle soreness. During foam rolling, individuals use their own body mass on the foam roller to exert pressure on the affected muscle group. A standard foam rolling protocol can be 20 minutes of foam rolling, performing different exercises targeting the muscle groups most used in soccer including: hip flexors, quadriceps, hamstrings, gluteals, groin and calves. For each muscle group, roll as smoothly as possible for two 45-second bouts on both the right and left legs. Involves low to moderate-intensity exercise that can be carried out after practice and games (also referred to as “cooling down”) or be a separate bout of physical activity held on a rest day. The duration of active recovery can be 15 to 30 minutes of land-based or water-based exercise, or a combination of the two. Active recovery on land can be continuous light aerobic work, or light resistance training – such as body weight strength exercises – all of which can be completed outdoors or at a local gym. Active recovery in water can include activities, such as swimming or simulated running in-place or jogging along the length of the pool. Also known as water immersion recovery, hydrotherapy consists of covering part of the body, or the whole body, in water. Community pools and showers at home both provide adequate means of utilizing hydrotherapy. Simply being submerged waist deep in a pool allows hydrostatic pressure to act on the body by displacing fluid from the lower body to the upper body, which is purported to enhance recovery. Another hydrotherapy recovery technique is contrasting water temperature, which consists of alternating immersion in cold and hot water and can be easily done in a shower at home. Simply alternate between cold and hot temperatures for 1 to 2-minute intervals for 2 to 3 cycles, ensuring water is in contact with the lower back and legs. Two styles of stretching that are frequently incorporated into warm-up and cool-down periods, respectively. Dynamic stretching is performed by moving a limb in a slow and controlled manner through its full available range of motion. The motion can be repeated several times with small increases in the speed of movement as the available range of motion increases. Static stretching entails selecting a target muscle that is slowly lengthened and held in a comfortable range for 15 to 30 seconds. As the position is held, the feeling of the stretch diminishes, and the athlete can move gently into a deeper stretch and hold again. Bompa, T. & Haff G. 2009. Periodization: theory and methodology of training. Champaign, IL: Human Kinetics. McAtee, R. & Charland, J. 2007. Facilitated Stretching. Champaign, IL: Human Kinetics. Reilly, T. & Ekblom, B. 2005. The use of recovery methods post-exercise. J Sports Sci, 23 (6): 619-627. Rey, E, Padrón-Cabo, A. Costa, P. & Barcala-Furelos, R. 2017. The Effects of Foam Rolling as a Recovery Tool in Professional Soccer Players. J Strength Cond Res.